This entry was posted on Wednesday, August 24th, 2011 at 5:33 pm and is filed under Uncategorized. You can follow any responses to this entry through the RSS 2.0 feed. You can leave a response, or trackback from your own site. I don’t worry about her name, I am only interested in fanservice. XD Nah, just kidding. Jynx helped Pilli a lot of times, I want to know how she returns the favor. Also, about the contest: You said you would post more info about it later. I’m just curious when the deadline for it is. Thanks! Too many mistakes I should get an editor…. 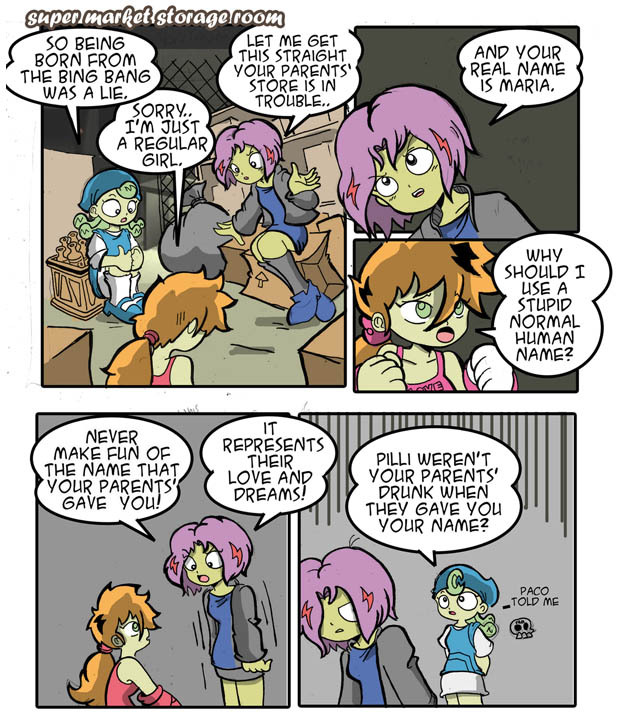 Pilli is kind of a weird name, but it’s cute! That last panel of Pilli gave me a weird flashback to the early Pilli Adventure strips. Also, +1 for the Bing Bang, it sounds like a lame 80’s party. now that I remember jinx has two sisters, and together they are las tres marias. Heh, funny stuff. Never understood or had heard the name Pilli ever. Made it hard to find this comic again when I forgot the link. Does “normal human name” imply that Jynx is an alien or monster? Also: the word “werent” in the last panel should be “weren’t”. WOO. Actually it’s “parents'” (with the ‘ after the word) because “Parents” is plural and plural posessors (and names that end with S) have the ‘ applied after them. THE MORE YOU KNOW WOOSH. Uh yeah but there’s no posession here. It’s just “your parents were drunk” reformed into a question, so it’s “weren’t your parents drunk?” no need for an apostrophe at all. Regardless, Jynx María de los Dolores Katya Ricarda Hilda Stephanie Guadalupe… could be a “normal human name” in a Venezuelan soap opera sincerely (and that probably means in certain real realities as well). “YOUR PARENTS’ STORE” needs that apostrophe, but no other instance of parents needs an apostrophe. I put it in the wrong place in my first correction. Sorry! Also, I am worried about all these gun fights being mentioned on Tavo2’s twitter. according to the governator those were false alarms, someone did prank everyone on facebook and there was chaos and confusion because they said that criminals did attacks schools, http://www.notiver.com.mx/index.php/primera/146925.html?secciones=3&seccion_selected=3&posicion=2 . It’s not so confusing: when a word ends in S (or Z or X or SH) the possessive [‘s] is not written normally but as a mere apostrophe (rule: no “S’S” or similar: it looks ugly and sounds the same). You can’t write – Luis’s – it must be – Luis’ – the apostrophe is indicated after the original S.
“Parents” is plural, so it ends in S (as most English plurals do) so when you mean “of the parents” you write – parents’ – and not – parents’s -. – Parent’s – would be “of the parent” (singular, either the father or the mother but not both).